I haven't seen scratchboard since art class in high school. 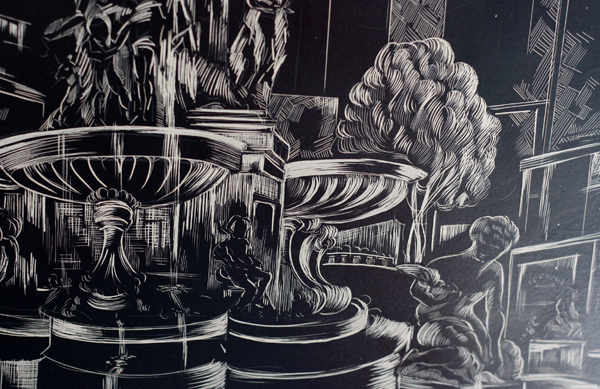 It's a fun medium— you scrape away a black ink finish to reveal the white coating underneath. 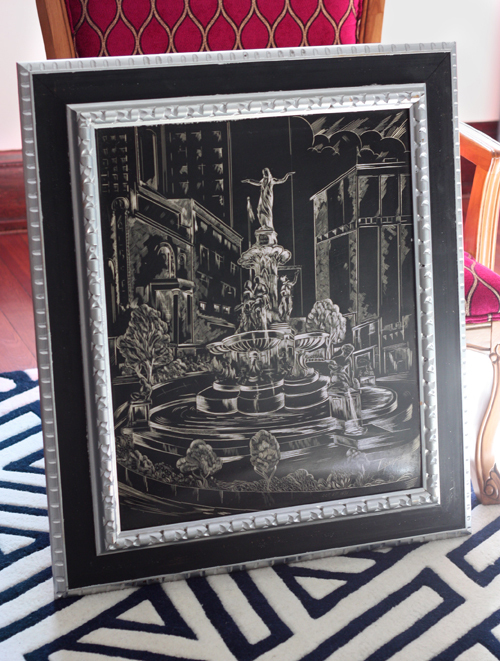 This weekend I picked up a scratchboard drawing done in the 60's by local artist Louis Speigel. I did some research and it turns out he is best known for his paintings of clown faces. I do not need any of those. But I liked this fountain. Original local art! It was an impulse purchase from my favorite antique store. I'm not sure exactly where it will hang, but I'm thinking the parlor. The subject is Cincinnati's Tyler Davidson Fountain, named "The Genius of Water," in downtown Fountain Square. To see some terrific examples of scratchboard art, head to scratchboard.org. There are a few tutorials and fascinating videos of artists drawing, too. That's nice! Hmm... I wonder if I have some of YOUR original scratchboard art around here somewhere! I'm scared that you might. In that case, I think I should look! Might make good blog fodder. ;) If I remember right, they were quite good! Don't you want your readers to see some more of your early art? P.S. I thought I only got silver. Was that other comment spam? I live in the Cincinnati area. - What was the antique store, and what other ones do you recommend? Duck Creek is my favorite. Check out Collecting Times Resale near it. Others: Riverside Centre Antique Mall and Ohio Valley Antique Mall. The Florence Antique Mall is so-so. For antique wood furniture, Every Now and Then is great. Jessica, thanks so much for sharing these stores. I'm visiting my family in Cincinnati this spring and I'm putting these on the to do list! Thank you for sharing this!! I live in NKY and was thrilled to see this post!! Thank you also for posting your favorite antique shops! I actually immediately recognized the fountain from Cincinnati. Because 1:I lived there almost 20 years and 2. Its in the opening credits of WKRP in Cincinnati!